Goddess is ripe and Her fertility sweeps the land, stirring the fires, and calling us to rise up and dance with HER! She is irresistible, alluring, confident, intoxicating. Not only does She embody the land, but Her sovereignty is the source of all those who would represent the land. Ancient traditional celebrations of Beltane and May Day included dancing the Maypole, bonfires, sacred sexual rituals in the fields to fuel the crops, and celebration of Goddess in Her prime. There is no romantic poetry to Beltane – it is primal, a bacchanal with Goddess at the center as Creatrix. The theme is full bloom. Full bloom almost. We are getting a bit of a late start to Spring here in the Northeast USA. The trees are finally starting to bloom, but the temperatures are still doing odd dances between winter and summer, sometimes in the same day. The promise of warmth and summer is there, though, and I am loving the light and the return of my birds. May is the perfect excuse to get outside, lighten up, and distract yourself from some of the intense astrological aspects that have been impacting us in the past few months. Saturn’s draconian tap dance may be tolerated while laying in the sun sipping lemonade. Right? Right. 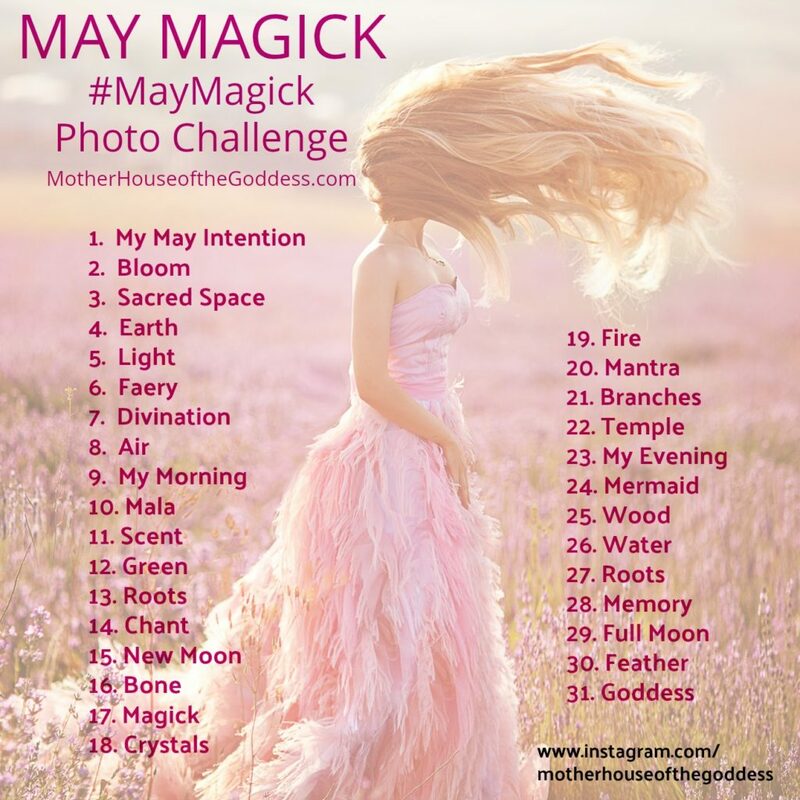 #MayMagick Photo Challenge starts May 1 – get the free prompts! Labyrinth and nature walks are perfect for May! Did you see our Goddess HiveMind for Spring Reading? Find a new book or five to read! ARE YOU A CRYSTAL HOARDER? Brandi Auset and I host a Crystal Flash Sale every Wednesday in the MotherHouse Facebook Group with special treasures and special pricing. Join us! Beltane Blessings with Susan Harper is now open! The Moon Witch with Renee Starr – discount coupon offered if registered by 4/30 – click here for details and payment plans! Thank you, love! Blessings to you! Thank you, dear one. Blessed be.